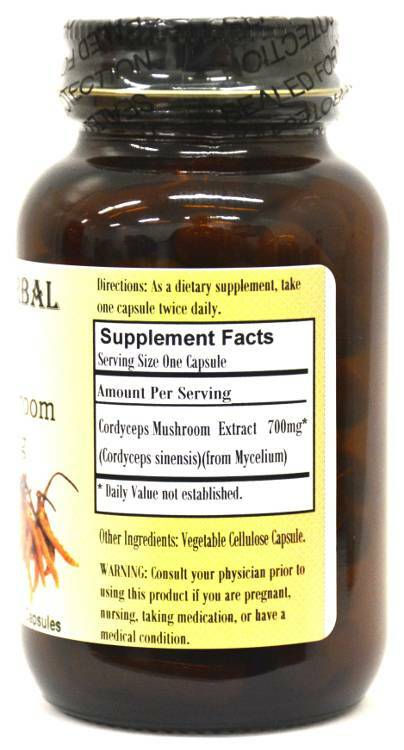 Barlowe's Herbal Elixirs proudly offers a Cordyceps (Caterpillar) Mushroom Extract standardized to 40% Polysaccharides. This is a very potent and concentrated extract. Cordyceps (Cordyceps sinensis) is one of the most valued and useful herbs in Traditional Chinese Medicine (TCM). Bottled in Glass! No Stearates! No Fillers! No Junk! 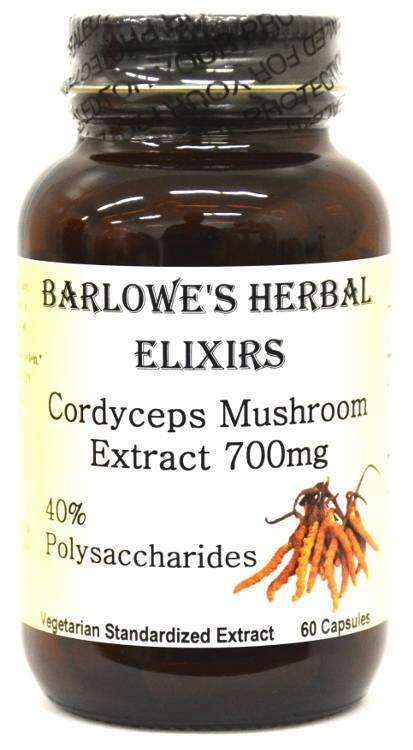 Barlowe's Herbal Elixirs proudly offers a Cordyceps (Caterpillar) Mushroom Extract standardized to 40% Polysaccharides. 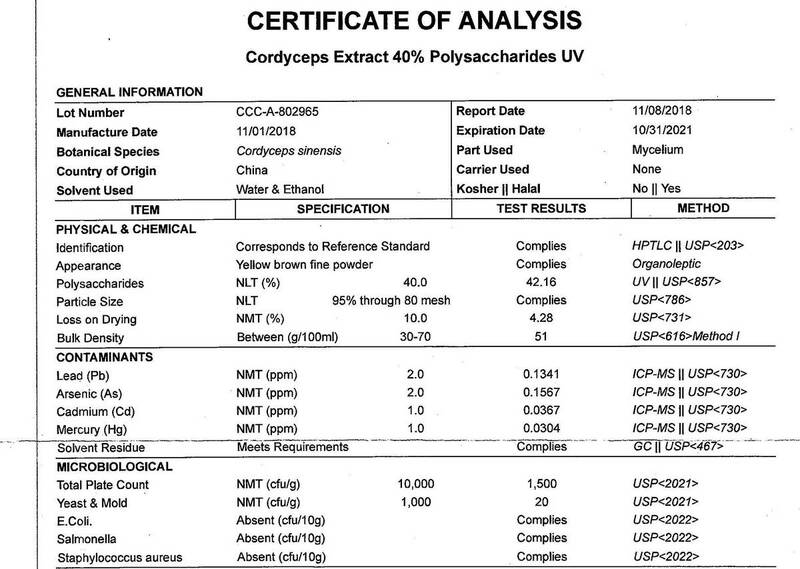 The Cordyceps Certificate of Analysis (COA) of this particular batch is shown above. Cordyceps (Cordyceps sinensis) is one of the most valued and useful herbs in Traditional Chinese Medicine (TCM). Bottled in Glass! No Stearates! No Fillers! No Junk! Cordyceps is a very interesting fungus. In the wild, the Cordyceps spores parasitize the vegetable caterpillar, consuming the caterpillar's soft tissue, and eventually sprout as a mushroom out of its body. It is collected in the mountainous regions of Tibet, and in the wild form is prohibitively expensive - up to a hundred dollars a gram. In ancient China, only the Emperor's Court was permitted to utilize this mushroom due to its rarity, usefulness, and great expense. However, scientists have recently discovered how to grow Cordyceps on an organic bed of material, and thus, Cordyceps has become more readily available and much less costly. In Chinese medicine, Cordyceps is reknowned as a very effective herb for treating many health problems. It has been classified as a general health tonic. Cordyceps increases levels of natural anti-oxidants and is believed to promote longevity. This fungus is also believed to help increase energy levels. It is especially good for people who are involved in athletics or enjoy vigorous sports. Chinese athletes who primarily used Cordyceps in their training programs surprised everyone by breaking the 10,000 meter World Track Record in 1993 and shattering dozens of world records in just one year. The team's coach credited much of the team's success to the consumption of Cordyceps! In a fertility study involving 22 males, eight weeks of Cordyceps supplementation increased sperm count by 33%, decreased sperm malformations by 29%, and increased sperm survivability rate by 79%. (Guo YZ. J Modern Diagnostics Therapeutics 1986;(1):60-65). In controlled studies, tests showed that elderly patients suffering from fatigue and some senility-related symptoms reported improvement in the reduction of fatigue (92%), of feeling cold (89%), in dizziness (83%), after taking Cordyceps for 30 days. Patients with respiratory/breathing problems felt physically stronger and some were able to jog for 600 ft. (Cao A, Wen Y. J Applied Traditional Chinese Med 1993;1:32-33). Caution: This superb extract is generally safe, but it is potent and should be utilized with care. This product is for dietary use. If side-effects occur, discontinue use immediately! The above statements have not been evaluated by the Food and Drug Administration (FDA). This product is not intended to diagnose, treat, cure, or prevent any disease. Directions For Use: Take one capsule twice a day on empty stomach. Results and usage amounts may vary based on body type and weight.